Audio is not only a pillar, but the foundational piece for a great meeting. Our goal should be to create a productive and intuitive conferencing experience. Today, there are many options and solutions on the market. However, often we find that setting up a conference session means navigating multiple complex interfaces and, when you get going, poor quality audio experience hampers and gets in the way of effective communication between stakeholders, especially remote attendees. For this discussion we will focus on two themes: ease of use of the technology and understanding the audio pillar/foundation aspect - especially given Dolby’s expanding presence in the space and reputation for audio quality. The Dolby Conference phone shown in Figure A comes equipped with many features. Dolby’s design focuses on providing the best audio experience possible (that is as close to being there in person as possible). Dolby started by looking at the interaction in group meetings and found that groups are often highly interactive and talk over each other. When we are present in-person, our brains can process all of the audio streams, and we can decide what we want to listen to based on visual and audio cues. With existing conference room audio solutions, it is not possible to completely replicate the audio from the far end of the room because the designs are optimized to detect the loudest voice and switch the microphone to focus on that talker. With highly interactive meetings, information can be lost. Dolby approached the problem in a different way, looking at how to completely replicate the in-room experience over a distance. The end result was the development of a new conference phone design that can capture all the audio in a room simultaneously (3 simultaneously active microphones) as well as play that audio out on the far end (three speakers), preserving the position and audio separation of the original talkers. To preserve this information, Dolby also came up with its own codec, DVC-2. Understanding the need for interoperability, the Dolby Conference Phone supports SIP and standard codecs as well. In this standard mode, it can provide a great experience. When using the Dolby codec end to end, the experience is truly lifelike. The Dolby conference phone datasheet includes all the specs. It is a dual-mode device that can function as an endpoint for a Dolby Voice enabled hosted conferencing service or a SIP conference phone for IP telephony or both. The value proposition is that you can make your normal calls through any IP-PBX or a hosted call control platform and also join Dolby Voice meetings. The Conference phone possesses voice placement capability when connected to a Dolby Voice enabled conferencing service. It picks up all the voices in the room and presents them clearly to the remote conference call attendees as if they are coming from specific distinct locations in the room. That immensely helps the remote conference participants to feel and effectively participate in the ongoing conversations as they are able to identify the speakers and follow their conversations. The device has an intuitive, touch-screen interface to start, join, and manage meetings. Even as conversations overlap in a meeting room it continuously maps the room, canceling out noise while boosting the audio of quiet or distant talkers, so that everyone is heard clearly. Dolby provides management software that aids with firmware upgrades, bulk provisioning and management of the conference phones. The choice is yours, you select the audio mode based on your needs, applications and the required setup. Let us now deploy and functionally test some of the key features of the Dolby Conference phone with a view to delivering an easy to use and a good quality audio Conference session through a hosted call control platform and also join Dolby Voice meetings. Please refer to the connectivity diagram in Figure B for the functional testing setup. BlueJeans for Windows application version 2.5.653.0 running on Windows 7 for connectivity to BlueJeans Cloud service with Dolby Voice. We connected the phone to a Power over Ethernet (PoE)-IEEE 802.3af capable network switch port and configured the requisite parameters. For the test setup, we had the Dolby Conference phone operating in dual mode as a SIP Conference phone that successfully registered with a hosted call control platform via an on-premises eSBC and also the BlueJeans Cloud service with Dolby Voice. DHCP Network Configuration Method ON – the phone obtained its IP address, subnet mask, Default Gateway, DNS Server IP address, DNS domain, DNS Server address and the Alternative DNS Server address. We configured the Primary and Secondary Network Time Protocol (NTP) Server address. Provisioning Server we pointed to the BlueJeans Cloud service with Dolby Voice. IP PBX Account settings, included display name, extension number, display number, transport type, and transport port. Under server-SIP domain name, Primary Call Server and port, Secondary Call Server and port, PBX Codecs list and the SIP credentials. The phone essentially pointed to the Patton SmartNode SN5570 eSBC. 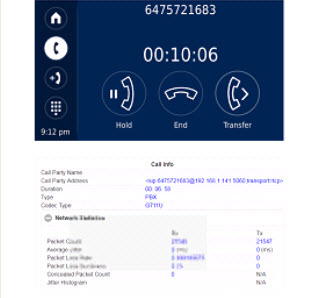 Now we had just one device that permitted inbound/outbound calling through the SIP PBX/SIP trunk and we were also able to join meetings using a BlueJeans bridge meeting ID and moderator code. The solution also supports calendar integration and with the “JOIN” button enabled a one-touch meeting experience. It is a tap and go device. We just had to tap the touch screen icons on the home screen to navigate the phone’s features and functions. It allowed us to start, join, and manage the meeting as well as share content. There were no numbers to dial to join a meeting .We just had to tap on the Join icon on the phone’s colour touch display and we were prompted to enter our meeting or event ID (passcode being optional). After entering the meeting ID, you can join the meeting as a participant or a moderator. If you tap on the People icon on the phone’s display, you are presented with a list of meeting participants and controls. 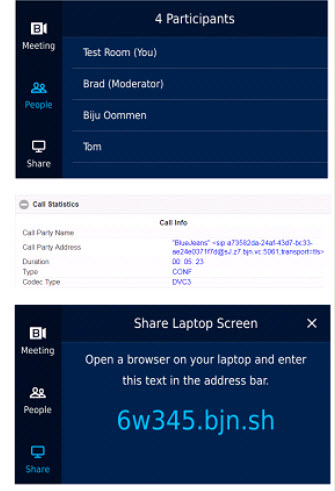 If you tap on the Share icon, the phone provides a link that a user can type into their browser to share their desktop or application in a BlueJeans meeting. 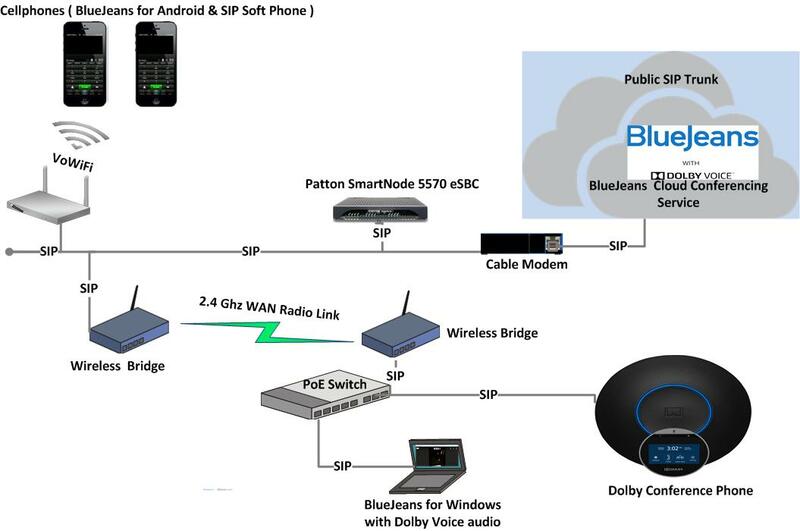 Referring to the pictorial representation in figure C and figure D, we were able to register with the public SIP trunk and successfully placed inbound/outbound calls from the Dolby Conference phone in IP phone mode through the Patton SmartNode SN5570 eSBC. The LED halo on the phone is a quick visual indicator. The halo lit up blue when we were on an active Dolby Voice call and green when on a standard SIP call. As expected, the halo lit up red when the call was muted. From an administrator’s perspective, we were impressed by the simplicity of installation and versatility of the Dolby Conference phone. We changed the Dolby Conference Phone settings using the phone’s web interface. Settings can also be changed using the provisioning server or the phone’s intuitive touchscreen user interface. From an end user perspective, the test audio conference calls felt like in-person meetings, even though we had participants in the meeting room, on a cellphone and a laptop. Everyone in the meeting knew who was talking and could easily follow the conversation. Remote participants could feel and contribute as if they were actually in the room. 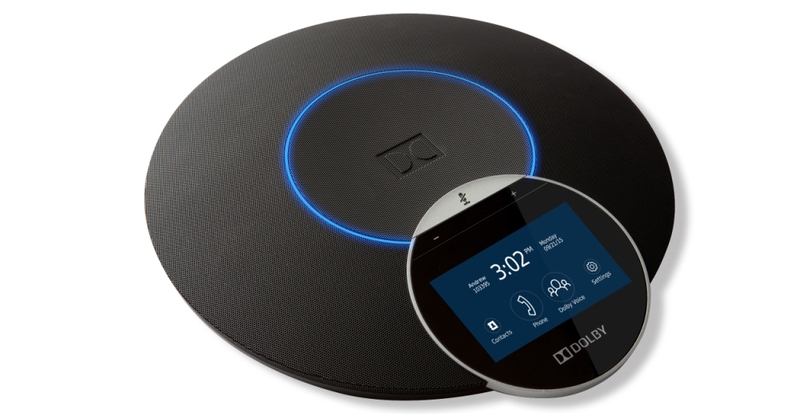 Given the continued dominant role of voice in real-time communication sessions, the Dolby Conference phone is well placed in any meeting room or space. To truly experience the stellar audio quality, you’ll need a Dolby Conference phone with a Dolby Voice enabled conferencing service. Indeed, the Dolby Conference phone is a good candidate for any meeting space, such as executive offices, boardrooms, huddle spaces, and conference rooms. It will help meet and exceed your goals and expectations of audio quality, simplicity, and ease of use. The phone also has a nice modern design that will complement the majority of today’s modern spaces.